Household finances are not that easy to manage. When you have more than one mind trying to handle it, things can get a bit complicated. This is probably why experts say that fights over money can wreak havoc in your marriage. In some ways, this is true. Financial concerns can be quite stressful. Getting two people to agree on something may take some effort – especially if the two of you have different styles when it comes to managing finances. This is why newlyweds should think about how they will manage their finances. Although you may still be on cloud 9 because of your recent wedding celebration, you need to talk about how you will handle your household finances. This is especially true if you intend on having a dual-income household. According to the data from PewSocialTrends.org, there is a growing trend wherein couple both work – even when the kids start arriving. The data revealed that 46% of parents both worked. This is actually a good thing because the cost of living is a bit high nowadays. If a family wants to live comfortably, both parents should really work. While there are families who can live in a one-income household, there is more convenience and security when you have two income sources. Of course, that poses a problem because a dual income household is harder to manage. This is why you need to agree on a strategy that will help you manage your finances at home. There are various ways for you to manage your money and there are three that most experts advise couples to follow. While all of them may be effective, there is one that may be a smarter option for more couples. 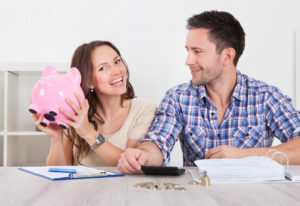 Before we discuss the best option, let us discuss the other two ways that couples can use to handle their finances. Joint management of income and expenses. The first option is to completely join your finances. What happens here is that you will put both of your incomes into one account. You will then use this fund to pay for everything that you need in your home. All the checking and savings account will be under the name of the couple. The couples who prefer this are those who want to generalize the unification that happened when they got married. This is also the best option for those who fell in love with an impulsive spender. The other can monitor the financial activities of their partner. For the spender, they would be more careful about their financial decisions. They know that their partner will see what goes on in the account – this is why they will try to develop the right habits that will make the other trust them. While this is great, it can be quite restricting. It would also be hard to surprise the other with gifts and treats because of the joint accounts. How can you hide the money to buy your anniversary surprise? You may be able to hide it for a couple of days but more complicated surprises that require prior preparation may be discovered. Not only that, a joint account will make both parties liable for the credit history of the other. The credit report of the each other will suffer because of the mistakes of the other. Income is separated and expenses divided equally. The other option is to separate everything and divide the household finances and expenses equally. This is great for those who have complete trust in their partners. Not only that, it can also be a great way to shield each other from your financial mistakes. Of course, that is a double-edged sword. You will not know if your partner is already racking up huge debts. If something happens to your spouse, you may find some of your assets taken from you because of the debt. Not only that, it can be unfair for the spouse earning less than the other. In an article published by NPR.org, one couple said that this type of arrangement put a strain their relationship. The wife who was earning less had to put in a bigger percent of her money in the household finances. This made her feel like she was giving more and that resulted in resentment towards the marriage. You need to consider the “gray areas” and try to decide what is really fair when it comes to dividing the expenses between the two of you. Now that we have discussed these two, let us go on to the best option for newlyweds to handle their finances. Income is separated but with a joint account for expenses. This option combines the two extremes. This is when the couple will maintain their separate incomes but will decide on an amount that they will put in a joint account. This account will contain the funds that they will use to pay for their expenses. What is great about this is that they maintain individual accounts that will give them the freedom to use their money. But any expense that is for the family will be taken from an account that the two of them can control. Ideally, you want to use the same percentage of your income as the contribution for the household budget. For instance, let us assume the family lives on a budget of $4,000 a month. The husband earns $3000, while the wife earns $2,000. The husband will contribute $2,400 while the wife will contribute $1,600. Imagine if the contribution is equal and not based on a percentage. The wife will have nothing left. You can see why the third is the best option for newlywed couples to handle their household finances. Of course, that does not mean the first two is wrong. There are couples who find the first two to be the best management strategy. But for newlyweds, it is recommended that they choose the third option first. It will help them test the best of the extremes and make adjustments depending on their financial management preferences and experiences. Regardless of the type of the option that you will choose to manage your household finances, one thing is for certain: you need to be in harmony with each other. Your finances will test your love, patience, and knowledge about your spouse. You need to work on being in unity with your spouse to ensure that no financial disagreements can put a strain on your relationship. To make this possible, there are two important things that you need to focus on. It is very important that you openly communicate with your spouse. This is especially true with your finances. You have to be very honest with each other because it will keep you from committing financial infidelity. As you are being honest, you should also respect each other’s preferences. According to an article published on WashingtonPost.com, 88% of Millennials who are married or with a partner said that financial discussions cause tension in their relationship. This will be lessened if you learn how to respect each other as you both try to be truthful about your financial goals, habits, and mistakes. The other thing that will help you stay harmonious is transparency. This is similar to honesty but it goes a step further. It will help you establish a trusting relationship with each other. Being transparent will also allow you to create a strategy that suits, not just one, but the preferences and personalities of the two of you. This is important if you really want to learn how to manage your household finances as a couple. Question: What are household finances? Answer: This refers to all the monetary activities is influenced by or affected by the household. In usually includes the income, expenses, and debts of the household. Question: Who manages the household finances? Answer: This will vary depending on the people in the household. Between spouses, it is important for the couple to make decisions together. While only one usually handles the money, both should be present in making important decisions that will affect the financial position of the household. Question: How to control the household finances? Answer: By creating financial plans, you can control your household finances. These plans can come in the form of a budget plan, spending plan, or an investment plan. It will help you get an overview of your finances so you can control it better. Question: How to budget your household finances? Answer: Budgeting your finances at home would require you to take note of your net income and realistic expenses. It usually begins with a detailed account of at least a month’s worth of expenses so you can see what you really spend on. Then, you will rank the expenses based on priority. The goal of the budget would be to ensure that the expenses will not go beyond the income. If it does, you can easily eliminate the expenses at the lower level of the list – since your expenses are ranked according to priority. Question: How to organize the household finances? Answer: Your financial plans will help you organize your finances. It all begins with getting an overview of your financial position so you can see the transactions you made in the past and where you want your finances to lead you. Organizing your household finances should also mean you will literally file all financial and bank statements. Keeping an organized record of these documents will help you make smarter decisions about the finances.